A Staten Island Library is a great place for students to study and do research papers, for children to develop a love for reading and for adults to read, increase their learning or find new information. If you're book lover in Staten Island be sure to check out a Staten Island Public library. This small Staten Island public library was established in 1903 been in continuous operation at its current locaiton for over 110 years. 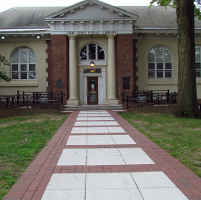 Tottenville Library houses a significant collection of books and materials on the history of Staten Island and surrounding areas. In addition to that this library in Staten Island also has a large collection of children's books and media, periodicals, reference books, and fiction and non-fiction books - including a Spanish and Russian language book section. Events take place regularly including book clubs for adults, storytime for children and homework help workshops. Computers and printers are available for public use. This public library is open Monday through Saturday.